Chris’ grandmother, Nana, has had Parkinson’s disease the past two years and has slowly digressed in health. A few days ago she was put under hospice care. We received a call on Tuesday night from Chris’ grandfather, Papaw, that Nana wasn’t doing well at all and that the doctors said she was in her final hours. We all prayed that she would make it to at least noon on Wednesday so her two sons (Chris’ dad and uncle) could arrive. Now Nana’s vitals have improved some, so her “final hours” could be hours, days or weeks. Please pray for the whole family: Everyone had prepared themselves emotionally to say goodbye yesterday and did. It is so exhausting emotionally to watch some one’s death be prolonged. Pray for Papaw: They were married for over 60 years (and he still refers to Nana as his “bride”—too sweet!). He is the liveliest man ever but is absolutely spent. Pray that he would feel comfort as he says goodbye to his wife. Pray that God would give him an overwhelming peace. Pray that at night he would sleep deep and feel the presence of God and not the absence of Nana. Pray for their children: Kurt (Chris’ dad), Jane and Karl. They have each exhausted themselves helping Papaw care for Nana. They have loved their mother with every ounce in them. No matter how old you are it is still devastating to lose your mom. Pray for their grandchildren: I believe this is the first close family member loss for all the grand kids. Pray for me: That I would be a comfort to Chris and our family. Pray that God would be glorified through all for this!! Chris and I were talking the other night that in an instant Nana will pass from this earth and be in Heaven. It is a place we believe in and are confident that we will be one day. But how crazy to think that it will be a reality for her in just moments. So often I long for Christ to be tangible, and for her it soon will be. Makes you think about life and question how it is being lived. Let’s not waste life, let’s live it. Praise God that through Him we are guaranteed abundant life!!! 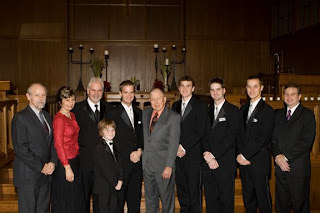 From the left: Uncle Bill (Jane's husband), Aunt Jane, Kurt (Chris dad), Chris, Papaw, Brian (Jane's son), Jason (Chris' twin), Billy (Jane's son) and Uncle Karl. Front row: Colton (Chris' brother).